NB IoT click is a Click board™ that allows LTE Cat NB1 connectivity by utilizing Quectel BC95-G, a specialized multi-band IoT module with very low power requirements and compact form factor, making it perfectly suited for various IoT-based applications. This module is an embedded IoT communication solution which supports several NB frequency bands, offering an alternative to similar Low Power Wide Area Network (LPWAN) solutions, such as those offered by Sigfox and LoRa. Its most important advantage is the ability to use already widely established cellular network infrastructures. These features make the NB IoT click a perfect choice for a wide range of IoT applications such as smart metering, bike sharing, smart parking, smart city, security and asset tracking, home appliances, agricultural and environmental monitoring, and more. 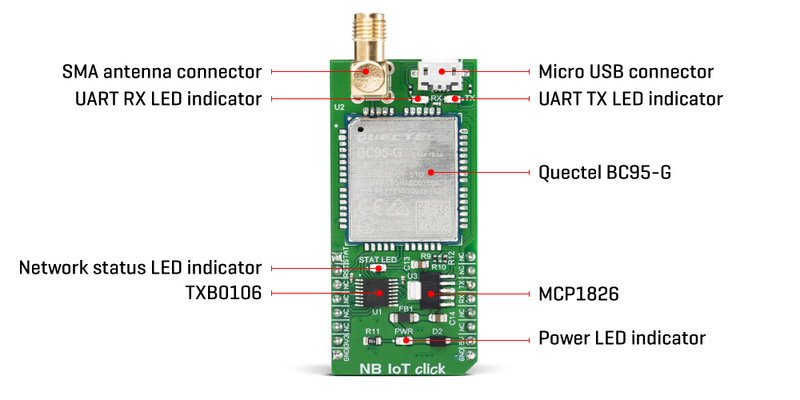 NB IoT click is equipped with the BC95-G module from Quectel Wireless Solutions, which supports LTE NB1 technology, developed with IoT applications in mind. It supports several NB frequency bands: B1, B3, B5, B8, B20, and B28. The module supports point-to-point MO and MT messages, widely used for M2M communication. Packed with the set of protocols that allow data and SMS transfer using the NB1 technology and the ultra-low power consumption makes this module a perfect choice when it comes to building IoT applications. As mentioned before, BC95-G module is the main component of the click board and it consists of a number of internal blocks or sections, such as the RF Transceiver section, Flash SRAM section, Power Management section, and the cellular baseband processor with the peripheral interfaces. BC95 module supports several peripheral interfaces, including two UART interfaces (including the main UART and debug UART interface), USIM card interface, and GPIO interface. The main UART interface can be used for the AT command communication and data transmission. It supports baud rates of 9600 bps. The main UART interface can also be used for the firmware upgrade. In that case, a baud rate of 115200 bps is used. The Quectel BC95 module has to be powered by a clean and stable power supply. The voltage needed for the module to work properly is 4V and it is derived from the 5V mikroBUS™ rail, through the MCP1826, a 1A low drop output (LDO) regulator from Microchip. Although the Quectel BC95 module is an ultra-low power device, its power consumption can briefly peak sometimes, so 1A LDO had to be used. The BC95 module does not have a dedicated USB interface, therefore a USB-to-UART circuit had to be added to the NB IoT click to provide USB to UART conversion. The FT230X, a highly integrated USB-UART bridge solution from FTDI is used, offering very simple integration thanks to its compact size and a small number of external components required. Two LEDs are used to signalize the data traffic through this IC: the red LED labeled as TX indicates the UART transmission, while the yellow LED labeled as RX indicates the UART reception. This Click board™ is equipped with the micro USB connector. It allows the module to be powered and configured by a personal computer. Quectel Wireless Solutions Company offers a software suite which can be used to configure the BC95 module. However, the FT230X IC requires drivers in order to work. FTDI offers drivers for all major OSes on their official driver download web page. Also, Windows OS drivers are included in the download section, below. The micro SIM card holder on the back of the Click board™ is used to install the SIM card. This device cannot be used without a valid SIM card which allows connection to the cellular network. Digital sections of the BC95 module are supplied with power by an integrated LDO regulator, so it is necessary to convert the logic voltage level of the microcontroller (MCU) communication lines. By utilizing the LDO output (routed through the MOSFET switching circuitry), the needed reference voltage is provided for one side of the TXB0106, a 6bit bi-directional logic voltage level converter. The reference voltage for the other side of the TXB0106 is taken from the 3.3V power rail of the mikroBUS™. The small switching circuitry composed of a few signal-level MOSFETs is used to provide a way to switch off the FT230X when the Click board™ is inserted into the mikroBUS™ socket. This allows uninterrupted communication with the host MCU. The module can be reset by pulling the RST pin of the mikroBUS™ pin to a LOW logic level. This pin is pulled up to a HIGH level by an internal pull-up resistor. Besides the hardware reset, the module can also be reset by using the AT command. More information about the available AT commands can be found in the download section, below. However, the Click board™ comes supported by the mikroSDK library. The library contains functions which simplify the software development, integrating several AT commands into a single function call. Using mikroSDK makes the code way more readable, but more importantly - easily portable.